Your parents are the most wonderful people you have ever met. They sacrificed hand over fist to give you a good childhood and to raise you to be the adult you are today. Now you have the opportunity to repay them by helping care for them in their senior years. We hope you cherish this time. It is an important part of the circle of life. With that in mind, we understand how tiring and stressful caring for senior parents can be. The task is especially challenging if mom and dad still live independently. They get by for the most part, but they need your help with routine things like shopping, cleaning, and getting to doctor’s appointments. Did you know you don’t have to handle all of this alone? We can help. 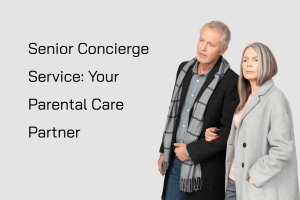 Our senior concierge service can be your parental care partner. We can come alongside and ease your burden by taking care of some of the things you just can’t get to. Senior parental care is taxing on so many levels. Over the years we have discovered that a lot of middle-aged children caring for senior parents have something in common: they have very little time to rest. Between managing their own lives and helping out their parents whenever they can, they just don’t have time to sit down and breathe. We offer senior concierge service because we believe you need time to rest. Not getting enough rest only adds to the fatigue and stress normal life exposes you to. And over a prolonged period of time, a lack of rest can make you physically and mentally unhealthy. Would you let us help you? If you are curious as to what we can do for you, let’s just say we can handle anything. Maybe your parents are not able to do regular cleaning at home. Perhaps you need someone to come in and clean the kitchen, scrub the bathrooms, and vacuum the floors. No worries. My Divine Concierge can handle it. Do your parents need to get to medical appointments? There is no need for you to take time away from work to drive them. Let us drive them instead. We will make sure they get to their appointments on time, every time. Weekly chores like getting to the grocery store are something else we can do. We can help your parents make their weekly shopping list and plan their meals. We can even help them clean expired foods out of the cupboards and fridge. We could go on and on listing the types of services we provide. Hopefully, you get the point. What we are really trying to say is that our senior concierge service is designed to come alongside you and be your partner in caring for your parents. Look, you don’t need the stress of doing it alone. You want to enjoy the time you have left with your parents. We want you to enjoy it too. But if you are constantly running around with a million things to do and not enough time to do them, you’re not going to have any quality time remaining. Put the load on us and take back some of that time for you and your parents. My Divine Concierge is thrilled to be able to offer senior concierge services. Please do not hesitate to contact us to learn more about them. And if you’re getting ready to downsize your parents, we can help with that too. Our downsizing services include decluttering, packing up, moving, and unpacking at the new home.